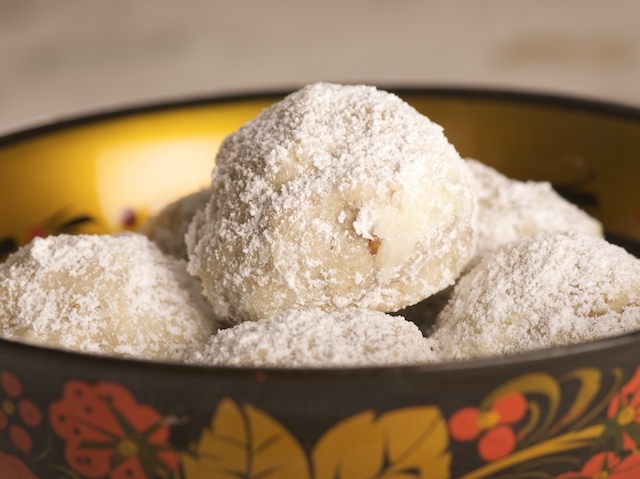 Tender, crumbly, melt-in-your-mouth cookies appear in many international cuisines: they might be Greek kourabiedes, Mexican wedding cookies, Russian tea cakes, or what are more commonly known as snowballs or butterballs. The recipes rely on at least one cup of butter, finely chopped or ground nuts, and a generous coating of snow-white powdered sugar (hence the reference to snow or weddings in some of their names). I grew up calling them "pecan butterballs," which perfectly describes these chubby, buttery, pecan-studded treats. Using an electric mixer, beat the butter in a large bowl until creamy. Add ½ cup of the confectioners' sugar and beat until smooth. Beat in the vanilla and salt. With the beaters on low speed, mix in the flour just until incorporated. Mix in the pecans. Preheat the oven to 375 degrees. Line 1 or 2 cookie sheets with parchment paper. Pinch off small clumps of dough and roll into 1-inch balls, arranging them about 1½ inches apart on the prepared sheet(s). Bake for 11 to 12 minutes or until the cookies are lightly golden on the bottom and just barely beginning to color on top. (If using 2 cookie sheets, rotate them from top to bottom and front to back about halfway through baking.) Let the cookies cool on the sheets for about 5 minutes. Place the remaining 1¼ cups confectioners' sugar in a shallow bowl. While the cookies are still warm, roll them in the sugar to coat. (Be gentle, because the cookies are fragile.) Set them on a rack to cool. Just before serving or storing, recoat the cookies with sugar.